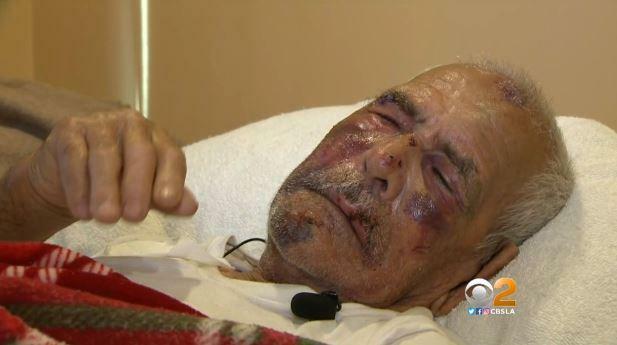 LOS ANGELES -- A woman has been arrested in the investigation of the beating of a 92-year-old man in Southern California. The Los Angeles County Sheriff's Department says detectives took 30-year-old Laquisha Jones into custody late Tuesday in Los Angeles and booked her into jail for investigation of assault with a deadly weapon. Rodolfo Rodriguez was beaten around 7:30 p.m. July 4 on a sidewalk in the unincorporated Willowbrook area. A witness made a video of Rodriguez moments later as he sat on the ground dazed, his face bloodied. The witness said the assailant struck him several times on the head with a brick. Rodriguez's grandson, Eric Mendoza, told CBS Los Angeles that his grandfather was on the sidewalk when he accidentally bumped into a little girl while trying to walk around her. In response, a woman believed to be the girl's mother threw Rodriguez to the ground and started hitting him with her fist. She then began striking him with the brick. A witness who was driving in the area, identified by CBS Los Angeles only as "Catherine," told the station the woman shouted "bad things" at Rodriguez as she beat him with her hands and then a chunk of concrete, including, "go back to your country, why are you here?" The witness said she took her phone out and got a photo of the woman, who appears to be holding a piece of concrete as her child stands nearby. Rodriguez is not seen in the photo. The witness said a group of about four men joined in the attack and the assailants fled as law enforcement was being called. "When I take the picture, she said, 'Oh, he tried to touch my girl.' I saw everything, this is a lie. And when the guys came, they hit him in the face, his body, everything," the witness said. Deputies responded to Martin Luther King Medical Center, where Rodriguez was taken for treatment. Rodriguez, who doesn't speak English, suffered broken ribs, a broken cheek bone and bruises all over his body. He has since been released from the hospital and is recovering at his home. "I'm just overwhelmed how anybody can do this to a human being at all," Mendoza said. "He's 92 years of age. There's no harm that he meant for you to treat him the way you did." In a news release Wednesday, the sheriff's department said that a motive in the attack is unknown and investigators are working to confirm the witness claim that several men joined in on the assault. The brick used in the beating has not been found. A GoFundMe page to raise money for Rodriguez's medical bills has already received more than a quarter-million dollars. Jones is being held on $200,000 bail. Anyone with information on the case should call LASD detectives at 323-568-4800.